Quick, easy, simple, delicious, healthy; this hummus is a must try. Smooth and creamy like you expect hummus to be yet has the light mild flavour of edamame. Adding protein rich hemp hearts in place of tahini, boosts the protein and adds healthy omega 3 and 6 fats. This mixture needs a little extra processing time to smooth out the hemp hearts but the result is smooth and creamy. It is perfect as a spread on crackers, pita or in a sandwich. Edamame, fresh young soybeans are a popular appetizer served in Japanese restaurants. As an appetizer or snack they are usually served in the pod after being lightly heated with a little water or blanched and sprinkled with sea salt. They are also terrific shelled into salads or added to a stir fry or as an easy healthy snack. They are a very good source of protein for vegetarians and vegans or anyone wanting a lean source of plant based protein. They have many other health benefits and are important sources of fiber, folate, iron, calcium and other vitamins and minerals. 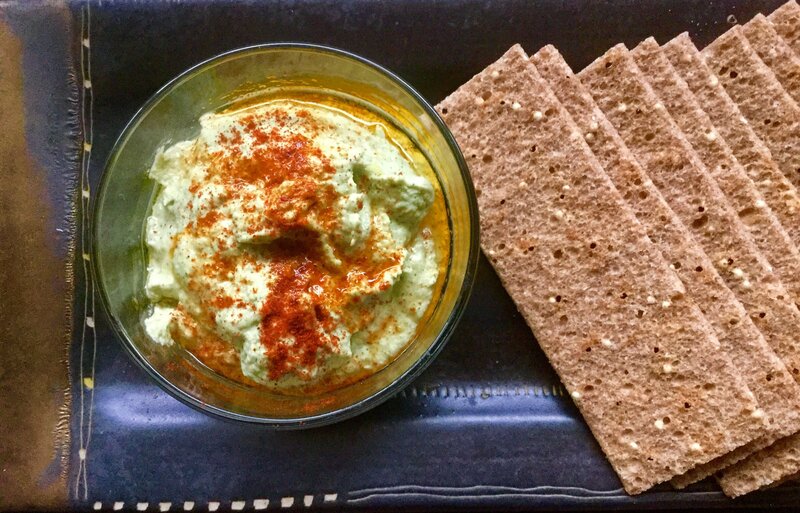 They have a rich and creamy texture that is appealing and also makes a terrific dip, spread or (as my husband calls it) edamammus. I made a further version of this recipe and will include the variation below. Instead of adding oil, use 1/2 or more of a fresh, ripe avocado. It is equally delicious and very creamy. It will darken (like all recipes using fresh avocado) after 3-4 hours so this variation is best used when you are serving the recipe right away. The darkening is a chemical reaction between an enzyme in the avocado and the oxygen in the air. It is perfectly safe to eat and will not affect the flavour, however some people are put off by the brown colour and find it less appetizing. Combine everything into food processor and process until smooth, scraping down a few times. It may take more time than usually to smooth the hemp hearts. Scoop into a bowl and garnish with olive oil and a good shake or paprika or smoked paprika. Makes approx 2 1/4 cups. Serve with fresh vegetables, whole grain crackers, or pita. This recipe was inspired by a few different sources. I saw the idea of using edamame in hummus first in the grocery store and started thinking about combinations and fiddling around with ideas. This is one of my favorite ways to soothe my creamy cravings! I am so glad you shared your healthy, delectable Edamame Hemp Heart Hummus recipe with us at the Plant-based Potluck Party. I’m pinning and sharing. This is one of my favorite dishes! I soothes my creamy cravings! I am so glad you shared your healthy, delectable Edamame Hemp Heart Hummus recipe with us at the Plant-based Potluck Party. I’m pinning and sharing. I have never tried hemp hearts before. Such a cool idea to include them. Thanks so much for sharing this with us at Savoring Saturdays gluten free linky party. Hope you’ll join us again this week. What a lovely recipe 🙂 Thanks for sharing at the plant based potluck. I’ve never learned to like edamame, but my sweetheart loves it. We have all the ingredients on hand, if frozen edamame is okay to use. Hoping to make a batch today! Thanks for sharing this on the Vegan and Plant-Based Food Roundup today. Hi Kathryn, Yes frozen is fine (I used frozen as fresh are not available right now). I like that you can buy packages of the frozen edamame that are already shelled. So convenient! I hope you enjoy it! Let me know! !